On June 11, in the wee hours of the morning, Willow Bay gave birth to two beautiful kids! 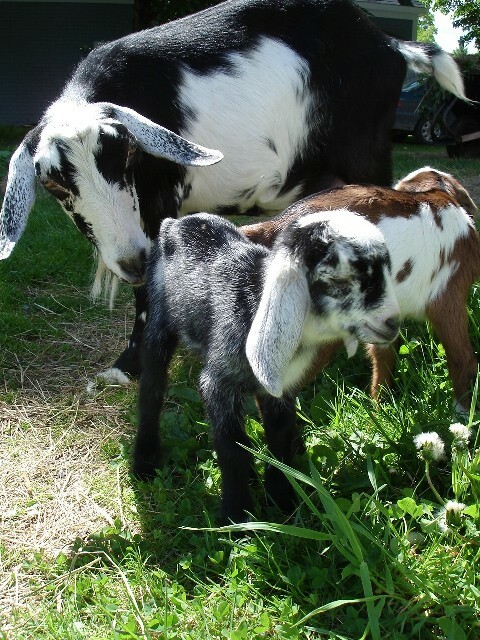 The daddy is a Nubian buck, and Willow is a mini-nubian (cross between a Nigerian Dwarf goat and a Nubian). Willow is the daughter of New Capricorn Esther, and Morning Star Macho Man. Esther would have been a proud grandmother! I was the most nervous of all, but things went fairly smoothly, the little buck coming out first, followed rapidly by his sister. I had my hands full getting them both cleaned off quickly (if there is a lot of mucous in their nose and mouth it has to be removed immediately so they can breathe). Pokey (Willow’s half-sister) accepts the new additions to the herd, giving them the occasional nudge to keep them in line. One day old, and out in the sunshine! Momma becomes protective and monitors them closely. The first day of summer! Nine years ago everything about the farm was a new experience. This day is also a memorial day for me; nine years ago, my beautiful black cat, Finbar, died at Turtle Hill, under the apple trees–where he lies buried today. Since then, many changes have come into my life, changes I could not have anticipated. Finbar is gone, and some other furred and feathered friends have come, and some of those have also left the world behind. Life truly is always in a state of change. So it’s a good time to start this blog about Turtle Hill. A good time to look back. Finding this farm was a journey, and it took ten years and a lot of fits and starts and detours. But when I saw this place, I knew it was the place I’d been seeking. And at that moment, one journey ended, and another began. When you give something a name, it changes the way you look at it, feel and think about it. Or if it’s a living being, him or her. In June 1999, having just moved here, I was digging something up, or maybe planting something, and wondering what name would befit this wonderful place. It was the place of my dreams. Just like I’d pictured it. Complete with a curving maple-lined lane, windswept meadows, old apple trees bent with age. The farm sits on a drumlin, a rounded hill of pretty good ground for growing things, which is why most farms in this part of Nova Scotia were made on drumlins. The shape of the farm reminded me of a turtle’s back. And I have a thing for turtles, which started before I remember, as I started drawing turtles at age two, for some reason. “How about Turtle Hill?” I wondered. But that seemed like a dumb idea; a place called “turtle hill” ought to have turtles. The next day, on the dirt road, just before the farm, what should be sitting right in the middle of the road, but a huge snapping turtle? I took it as an omen, and Turtle Hill Farm it was. And is. 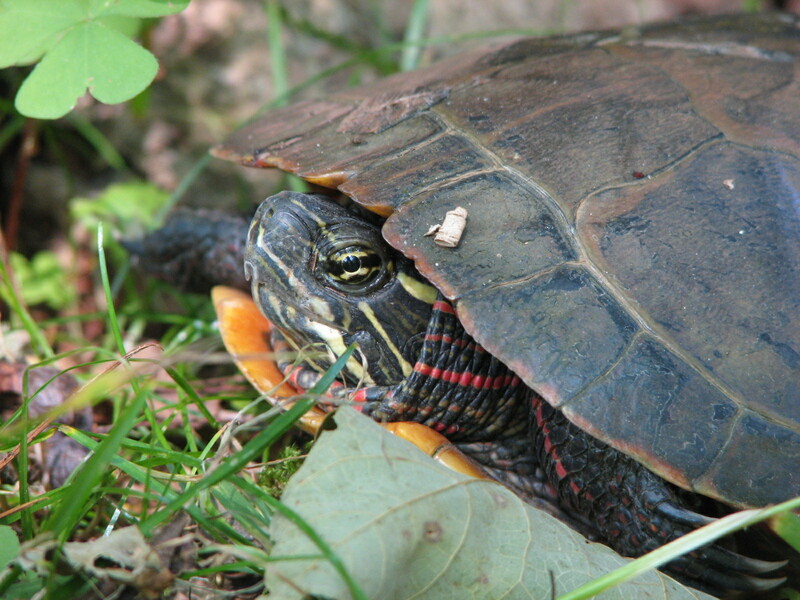 Since then, I have sighted Eastern Painted Turtles on two occasions, on the paved main road as I travelled to town and back. Of course, I rescued these wayward amphibians from imminent death by car tire, and released them in my stream. I have not seen them recently, but I hope they are still hanging around.